In Part 1 of this continuing series on dark matter, I reported that scientists have been perplexed by the apparent lack of sufficient matter in the Milky Way Galaxy to keep it from flying apart. Space is expanding and scientists theorize that something they call dark energy, which is everywhere in the observable universe, is causing that expansion. Since space is not expanding in our Milky Way, the matter present must be generating sufficient gravity to overwhelm dark energy. 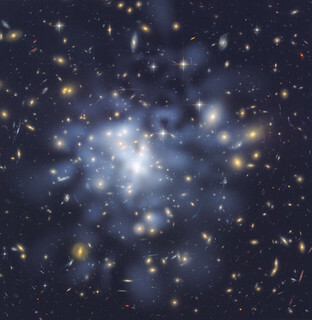 Scientists know that matter is a source of gravity and gravity holds galaxies and galaxy clusters together. Our Local Group, for example, is a cluster of galaxies that is composed of our own Milky Way, Andromeda, and several dwarf galaxies nearby that have been identified. However, when scientists total up all of the observable matter in our Local Group, they find that it falls far short of the amount of matter that is required in order to generate enough gravity to defeat dark energy and hold the two galaxies and the dwarf galaxies together in our Local Group. The lack of sufficient observable matter to hold galaxies and galaxy clusters together, such as our Local Group, is a well known feature of the observable universe. Scientists have developed a simple theory that, if true, would explain why galaxies and galaxy clusters hold together. They have theorized that there must be a type of matter made up of invisible particles (i.e., they do not emit light) that permeate vast regions of space and it acts like a gravitational matrix or web within which galaxies can develop. It is a beautiful and simple theory, except that they have not identified a particle of dark matter and still do not know what it is. Dr. Sukanya Ckakrabarti at the University of California at Berkley has proposed a theory to explain why scientists have not detected more dwarf galaxies in our Local Group. She has proposed that such galaxies are present, but we cannot see them because they are made of dark matter, or concealed by it. A year ago at the annual meeting of the American Astronomical Society in Seattle, she reported that she had discovered gravitational ripples at a location in space at the far edge of the Milky Way, approximately 260,000 light years from the center of the galaxy. These gravitational ripples correspond to what she was looking for; namely, the visible gravitational effect of a dwarf galaxy composed mostly of dark matter. She calls it Galaxy X, and if it is there, it will be about 20% of the size of the Milky Way. Meanwhile, she has to wait in line for her turn to use the Spitzer Space Telescope, just like all of the other scientists waiting for their turn to study space. Now, the exciting news. In a letter published today in Nature, a professional scientific journal, S. Vegetti, D. J. Lagatutta, J. P. McKean, M. W. Auger, C. D. Fassnacht, and L. V. E. Koopmans have reported that they found a small anomaly in a gravitational lens that may be a small satellite galaxy that’s too faint to be seen via direct observation. Mass affects the path of light, as a consequence of the general theory of relativity. For a sufficiently large mass, the light’s shift may be sufficiently large that we can measure it, and it can produce lensed images of the original light source. In gravitational lensing, the lens is a galaxy or galaxy cluster lying between Earth and a distant source, itself typically a galaxy. If the lens is directly in the line of sight, the image of the source galaxy can be distorted into an Einstein ring, a circular image of the source. By studying the shape and other characteristics of the image, observers can reconstruct details about both the lens and the source galaxies. A particular lens system, JVAS B1938+666, is a distant elliptical galaxy that produced a bright Einstein ring image of an even more remote source galaxy. Independent observations by the W. M. Keck Telescope’s Near Infrared Camera 2 and the Near Infrared Camera aboard the Hubble Space Telescope provided the basis to reconstruct the mass distribution in the lens galaxy. The analysis by Vegetti and colleagues found an anomaly in the results; explaining it requires either an extra bit of mass in the lens or some intervening dust to block the light from parts of the image. However, dust absorbs light in a particular way, changing the spectrum of the image, and the team failed to find the appropriate signature. That leaves the most likely culprit being another clump of mass that isn’t part of the main lens galaxy. Subtracting a reasonable model for the elliptical galaxy leaves the image pattern that would be produced by this hypothetical clump of mass. If you assume that this lensing isn’t from an unconnected galaxy with a smaller effect, then the clump of mass can be characterized fairly easily apart from the larger elliptical galaxy. Starting with assumptions taken from standard dark matter simulations, the researchers attempted to fit the location and mass of the clump, and found something consistent with an object in the same mass category as the Sagittarius dwarf galaxy. Although the research letter published today in Nature calls this dwarf galaxy candidate “dark” both in the title and description (implying no emitted light), the authors do point out that they can only put a ceiling on the luminosity on the object. That maximum limit is still brighter than several of the Milky Way’s dwarf satellite galaxies. In other words, it’s premature to declare that a dark galaxy has been found, even if the mass estimate holds up under further investigation. The scientists report that the lens galaxy is about 3 billion parsecs away. A parsec is the distance traveled by light in 3.26 years, or about 19 trillion miles. In other words they are detecting light that was emitted by the lens galaxy when the universe was half its present age. Detecting any small galaxy at that distance is not only an impressive feat, but also gives us some hints about the history of the formation of galaxies farther back in time. Since the candidate dwarf galaxy was found using parameters from dark matter simulations, the authors argue that the simulations may not be as far off as they have seemed. Scientists figured out years ago that there was nowhere near enough matter in our Local Group of galaxies to create enough gravity to keep them from flying apart. Our Local Group consists of our own Milky Way Galaxy, the Andromeda Galaxy, and several dwarf galaxies. They reached the same conclusion regarding all of the galaxy clusters in the observable universe. Realizing that something must be holding them together, they deduced the existence of a form of invisible matter and called it dark matter. There must be a lot of it because, to account for the stability within galaxy clusters, approximately 73% of the universe must be dark matter. Think of it as a kind of matrix or web within which galaxies form and develop. Ordinary matter which makes up the stars, planets, and all visible objects in the universe, including ourselves, only makes up about 4% of the universe. The rest, or about 23% of the universe, is another theoretical concept called dark energy, which exists in deep space in the regions between galaxy clusters. It causes space to expand, which explains why space is expanding between the galaxy clusters. One problem with the theory of dark matter is that there should be more dwarf galaxies in our Local Group than have been observed. Last year, at the annual American Astronomical Society meeting in Seattle, Dr.Sukanya Chakrabarti from the University of California at Berkley presented her theory that they are present, but basically rendered invisible to us by dark matter and she proposed to look for evidence of their presence using radio telescopes to analyze disturbances in the vast clouds of hydrogen gas at the farthest reaches of the Milky Way. Her idea is similar to attempting to find a boat by searching for its wake. Using the method, Dr Chakrabarti found a set of ripples that indicate a comparatively huge satellite galaxy, 260,000 light-years from the centre of the galaxy. The satellite – dubbed Galaxy X in deference to the 19th-Century discovery of Neptune that named it Planet X – should weigh between three and 10 billion times as much as the Sun, about a hundredth as much as the Milky Way itself. Now all that remains is to confirm it. That will have to wait until Dr Chakrabarti’s collaborators are granted time to use the Spitzer Space Telescope. For more information about Dr. Chakrabarti, go here. This year, at the annual meeting in Austin, a team of scientists from the Canada-France Hawaii Telescope presented four palm-print size images taken during different seasons of the year, each showing a region of space more than a billion light years across. Together, they represent the images of more than 10 million galaxies, whose light gives the only hints of the large-scale structure of dark matter. “Light coming toward us from a distant galaxy is bent by the gravity of a lump of matter in the middle,” explained Catherine Heymans of the University of Edinburgh. “Einstein’s theory of general relativity tells us that mass bends space and time, so when light comes toward us through the Universe, if it passes some dark matter, its light gets bent and the image we see gets bent and distorted,” Dr Heymans told the meeting. Check out the four images here. As the evidence for dark matter begins to add up, it seems to be only a matter of time before scientists finally detect a particle of dark matter. Perhaps, the Large Hadron Collider will git ‘r done next year.